The fact that Matraca Berg has fully rehabilitated her creative talents and is writing exceptionally well crafted country songs again is welcome news to lovers of this music right across the globe. Those in the UK have the added benefit of Matraca now actively promoting her material over here with a long awaited headline solo tour to build on the success of her valuable contribution to the Wine, Women and Song project. 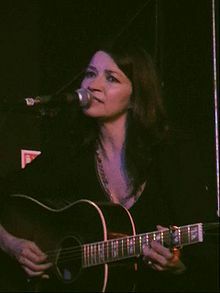 Although there was a decade- long wait for an album of newly recorded material after 1999’s LYING TO THE MOON AND OTHER STORIES, the brace of recent releases has presented Matraca with the perfect set of songs to raise her UK profile as a performer in her own right and not just a Hall of Fame songwriter who the cream of 90’s Nashville regularly turned to for material. This short eight-date tour saw Matraca return to some of the venues she has shared with Gretchen Peters and Suzy Bogguss on her previous trips, but the turnout on this Sunday evening at the elegant Assembly in Leamington Spa suggested she still has a little way to go to match the popularity of these regular UK visitors. Matraca herself commented that they may have overdone the size of the venue. However on the evidence of the high quality performance put on by Matraca and her musical partners, David Henry and Jason Goforth, it shouldn’t take too many more visits to attract the numbers her talent warrants. It was of no surprise that the show was almost entirely devoted to the material from 2011’s THE DREAMING FIELDS and the recently released LOVE’S TRUCK STOP. The title track from the latter launched the set and this was immediately followed by ‘Her Name Is Mary’, ‘I Buried Your Love Alive’ and ‘Waiting on a Slow Train’. As is usual from a well renowned singer-songwriter, most songs are accompanied by stories surrounding their origin and on this evening we delved into the world of prostitution with ‘Magdalene’ and the Gulf oil disaster with ‘Black Ribbons’. All these are outstanding tracks from the latest album. Having listened extensively to both albums recently, the live performances of four tracks from THE DREAMING FIELDS slightly tips the favour towards this release. The memorable melody of ‘You and Tequila’ demonstrated why mainstream Nashville still has one eye on Matraca’s output, with it being a massive hit for Kenny Chesney and Grace Potter a couple of years ago. ‘Oh Cumberland’ has always been a personal favourite and its appearance on the set list was one of the show’s highlights. The story accompanying the song was the homesickness, Nashville born and bred Matraca felt when being exiled to LA during the years when she was under the wing of the big labels. The informative evening also saw her explain how uncomfortable she felt being moulded into a country star and, when eventually dropped, how she sought solace in the alt-country Americana movement that embraced her in the late 90’s. Another live highlight from this album was the touching personal account of the effect of war on those left behind which heralded her performance of ‘South of Heaven’ on which she opened up her emotions for a short moment. This UK visit has seen Matraca briefly team up with husband and member of the highly acclaimed Nitty Gritty Dirt Band, Jeff Hanna but on this evening her musical collaborators were just David Henry on various guitars and Jason Goforth on Lap Steel as well as some other mysterious instruments, one resembling a telephone. They together supported Matraca’s highly capable vocal skills and acoustic playing, all being effectively supported by the venue’s outstanding sound system. The evening ended with a short reminder that Matraca is much more than her two latest albums. This included her version of the song that paid the bills in its day - 1997 CMA Song of the Year ‘Strawberry Wine’, the requested ‘Lying to the Moon’ and a little self-indulgent tribute to Neil Young with a cover of his ‘Old Man’. This left those present perfectly satisfied with the evening’s entertainment, which included an opening set from local singer-songwriter James Foley. Also it created an air of optimism that the numbers can be swelled the next time she visits by spreading the word that Matraca Berg is an artist definitely worth catching live.